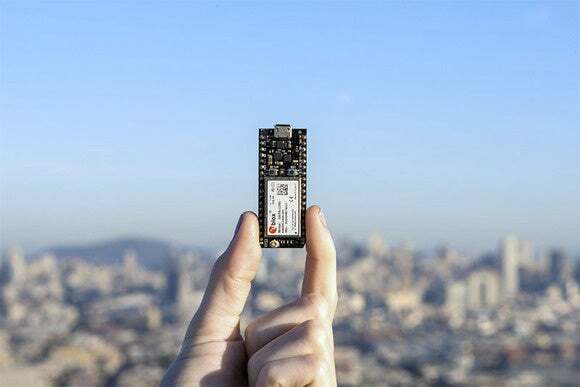 You might be familiar with Spark, a company that’s best known for its Spark Core, an open source Wi-Fi development kit for creating Internet-connected devices. It drew considerable interest on Kickstarter as it blew past its funding goal a year ago before yielding to Photon, a spiritual successor with more bells and whistles. Now Spark is back on Kickstarter, though this time it wants to disrupt the cellular space with its Electron development board. The Electron is a tiny $39 circuit board that you can think of as a cellular-connected Arduino with a SIM card. It also has an ARM Cortex M3 processor, 128K RAM, 1MB of flash storage, and a USB port. Spark says the Electron plays nice with the rest of the Spark family, though the real appeal here is its cellular connectivity. Cellular service can be cost prohibitive, so Spark partnered with un-named carriers so that it could offer contract-free cellular service for connected products. Rather than sell unnecessarily large amounts of data at a premium price, Spark’s plan runs $3 per month for 1MB of data; each additional MB costs $1. While that doesn’t sound like a lot, Spark says its messages tend to be around 50 bytes or less, meaning you can send and receive 20,000 messages per month. To put that into perspective, you’d only need 720 messages for a connected device that records the temperature every hour. What this boils down to is a play for the cellular Internet of Things market, otherwise known as M2M (Machine to Machine). According to Spark, breaking into the M2M scene isn’t easy, as it was setup for companies that make industrial products such as shipping containers. That’s the world Spark is hoping to disrupt with Electron. Why this matters: Tapping into affordable cellular connectivity opens up a whole new world for the consumer IoT market. By breaking through the distance barriers of Wi-Fi and Bluetooth connectivity, products like pet collars with location tracking to agricultural gadgets outside the bounds of Wi-Fi suddenly become fair game. The sky is literally the limit here.